Disputes about Stalin’s role in history have flared up again, as the legislature of the city of Volgograd rules that the city shall be called Stalingrad on dates commemorating key anniversaries of World War II. This time the decision to rename Volgograd on World War II anniversary dates (in particular on Feb. 2 – the anniversary of the end of the battle at Stalingrad) was taken by the Volgograd city duma “on the basis of numerous requests by veterans of the Great Patriotic War.” The law, however, requires that, if a city is to be renamed, there must first be a referendum in which not less than half the city’s residents must vote. Those who took part in the Battle of Stalingrad are not all of one mind on the question of renaming the city. “You’ll never get a clear answer on who needs this and who doesn’t. The people should make this decision. Then, when there’s been a national discussion, a decision should be taken,” says Alexander Maklakov, chairman of the regional council of veterans. So far, no more than 50,000 people have officially supported the idea of renaming the city – on the eve of the voting in the Volgograd duma, the Communist Party of the Russian Federation (CPRF) and the Trade Union of Russian Citizens handed in to President Vladimir Putin’s reception room 50,000 signatures calling for Volgograd to be renamed Stalingrad. In Paris, for example, there is indeed a Stalingrad metro station, situated near the Place de la Bataille de Stalingrad. However, one might see more than a desire to grow closer to Europe in the initiative to rename the city. This fall, the residents of Volgograd have to elect a mayor and a city duma. “The Volgograd–Stalingrad issue crops up every time before an election, and then it fades away afterwards. 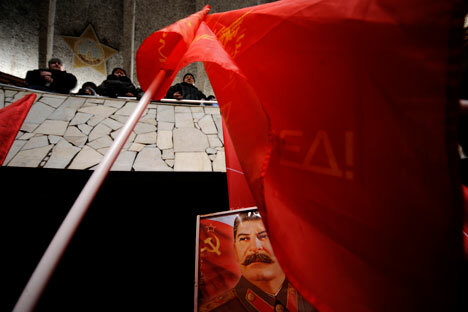 It’s usually the Communists who exploit it,” says Oleg Mikheyev, a duma deputy from the Just Russia party representing the Volgograd region. Sixty years after the death of Stalin, many people in Russia value his role in history highly. In 2008 the Rossiya federal TV channel asked viewers to choose the “the most esteemed, prominent and symbolic person in Russian history” by voting in its “Name of Russia” poll. More than 519,000 out of a total 4.5 million viewers voted for Stalin. Only Prince Alexander Nevsky, who repelled the crusading Teutonic Knights in the 13th century, and Prime Minister Pyotr Stolypin of the Russian Empire, who is considered one of the greatest Russian reformers, received more votes. Mikhail Fedotov, head of the Russian Presidential Council for Human Rights, does not regard the Stalinists’ action as ethical. “If you want to honor the memory of our heroes, there are more civilized and justified ways, more appropriate to the role played in the war by the ordinary soldier, the ordinary officer and the ordinary general, and not the Supreme Commander-in-Chief, on whose conscience are millions of innocent victims,” says Fedotov. In the end, the idea of permanently renaming Volgograd Stalingrad was not supported by the city or the presidential administration. "Renaming the city wasn't discussed in the Kremlin. It even wasn't in the agenda, " said Putin spokesman Dmitry Peskov in comments to Russian daily Izvestia. Analyst Gregory Birg agreed with the logic of the authorities. According to him, renaming the city could be very expensive. The costs to the population of changing documents could reach up to 550 million rubles ($18.3 million). Based on materials from Rossiyskaya Gazeta, MK, Gazeta.ru.